Lady Eagles Janessa Ximenez (4) and Chloe Bryant go for a block. 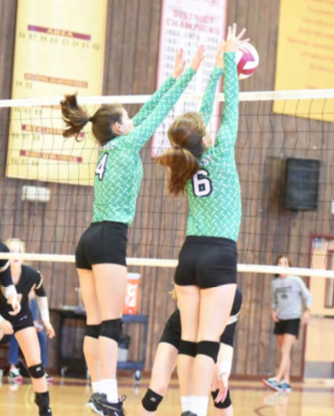 DEVINE—For the second week in a row, the Pleasanton volleyball team found itself playing in the third-place game at a tournament. This time, however, the Lady Eagles did not close the deal. San Antonio Highlands topped Pleasanton 25-16, 25-21 to claim third place at the 16th annual Devine Arabian Volleyball Roundup on Saturday, wrapping up three days of competition. The Lady Eagles fell to eventual champion Devine in the tournament semifinals, 17-25, 23-25. The Arabians beat Class 5A Corpus Christi King in the championship match. Overall, Pleasanton went 4-2 at the Roundup, including a 3-0 run through pool play. Junior outside hitter Laken McAda made the all-tournament team for the Lady Eagles. Jourdanton also took part in the 16-team tournament, going 4-2 as well. The Squaws won their final two matches of the competition, earning fifth place in the process. Jourdanton took down Hondo 25-21, 25-23 and also beat Marion on Saturday 25-19, 25-22. Jourdanton senior Savannah Bronstad was picked as an all-tournament selection. The Lady Eagles and Squaws competed in one of the tightest matches of the Roundup to kick off play in the championship bracket Saturday. Pleasanton defeated Jourdanton 29-27, 26-24 after the Squaws finished second in their pool. Jourdanton beat Sabinal 25-21, 25-7 to open the tournament Friday before topping Somerset in a comeback effort. Jourdanton’s Jenna Kuykendall (left) sets up teammate Samantha Meyer. The Squaws dropped the first set but rebounded to defeat the Lady Bulldogs 14-25, 25-14, 25-17. 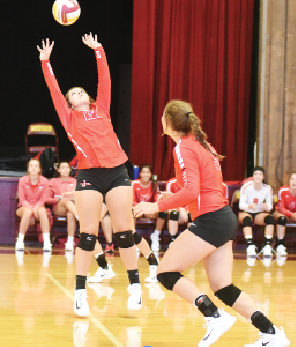 Jourdanton fell to King in its final pool match to take second place. The Lady Eagles won their pool Thursday without losing a set. Pleasanton defeated Brackettville 25-13, 25-21 in the first game of the tournament. The Lady Eagles went on to beat San Antonio Lanier 25-14, 25-10 and Natalia 25-9, 25-13. Pleasanton improved its record to 11-4 on the season. The Lady Eagles took on Lytle at home Tuesday and will travel to face Universal City Randolph on Friday. Jourdanton, which beat Orange Grove on the road last week, moved above .500 following the tournament. The Squaws were 8-7 entering Tuesday’s matchup with San Antonio Harlan. The game was scheduled to be played at Jourdanton but moved to Harlan because of ongoing construction on the Squaws’ gym. Jourdanton athletic director Darrell Andrus said the gym should be ready for the team’s Aug. 29 match against Pearsall.